My great-great-grandfather on my mother’s maternal side was Enoch Keithley. Enoch was born April 5, 1831 in Missouri. My daughter and I have found five records specifically linked to Enoch: a marriage record, the 1850 and 1860 federal census records, an 1855 Wisconsin state census and records of his service with the Wisconsin 16th Infantry during the Civil War. The 1850 census for Jo Daviess County, Illinois listed Enoch as 18, indicating a birth date of about 1832, and as being born in Missouri. Although he was not listed with an occupation, he was also not living with any known family member. David Matlock. whose family he was enumerated with, was a collier – someone who works in a coal mine. The head of household below was also a collier; it is probable that Enoch would soon be working for the mine as well. My daughter, Kay, had quite a search in order to find the marriage record for Enoch and his wife, Amy Turner. It was eventually with the help of a records clerk that the oddly spelled record was located and on a 2008 trip to Illinois and Wisconsin we saw that marriage listing in the county record book. It was Enoch Ethley [the name obviously recorded based on hearing the two names elided together] and Emma Turner. They were married on August 29, 1852 in the small community of New Diggings, Wisconsin by a Justice of the Peace named Joseph Thompson. We drove through New Diggings on our trip; by 2008 it was mostly just a bend in the road with businesses on each corner surrounded by several homes. I took a photo of one of the buildings that may well have been a part of that community when Enoch and Amy were married. 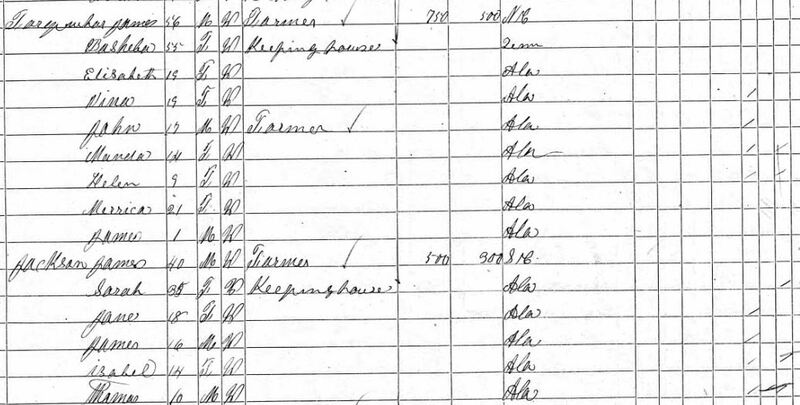 An 1855 Wisconsin state census listed Enoch Keithley [transcribed as Kershley or Thershley] enumerated the household of two males and one female in New Diggings. The family unit at that time would have been Enoch and Amy and their first child, Joseph Henry, born in 1853. Enoch and his wife, Amy, and their three sons were enumerated in the 1860 census for Schullsburg, Wisconsin [Lafayette County]. They were enumerated next to the George and Juditha Turner household; other research showed that George was Amy Keithley’s brother. Enoch was listed as a farmer who was 28 and born in Missouri. By 1861, the United States was in a time of extreme turmoil over the issue of states rights. 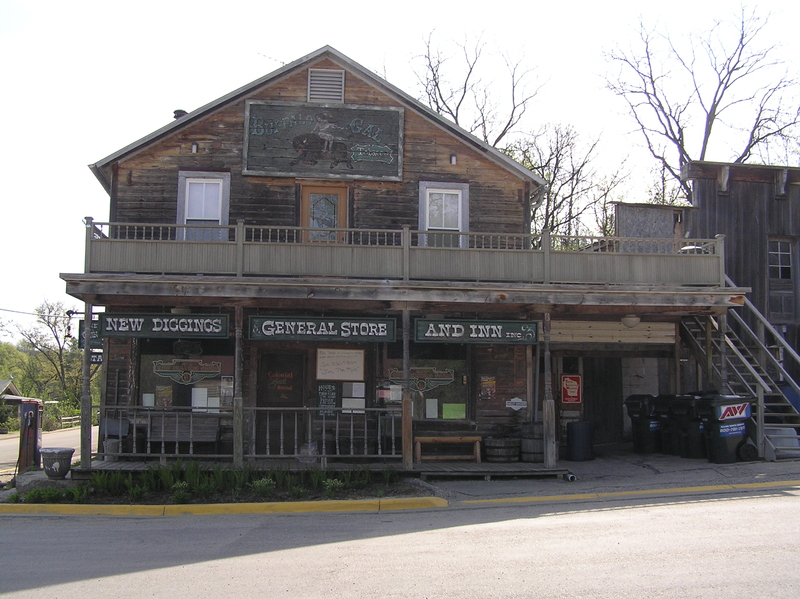 Ulysses S. Grant, who was a resident of Galena, Illinois just over the border from Wisconsin, was rallying support for the Union cause and many of the men of the area joined the fight. Enoch’s brother-in-law, George Turner, joined the Union cause on September 16, 1861, and Enoch followed suit on November 4, 1861; records indicated both of them were residing in Darlington, Wisconsin at the time of their enlistment. When the Wisconsin 16th Regiment Infantry was organized at Camp Randall in Madison, Wisconsin and mustering in completed on January 31, 1862, Enoch and George were a part of Company I. Military records for the regiment state they departed by boat for St. Louis on March 13, 1862, arriving on the 15th. They embarked on transports from St. Louis on March 16 traveling the Tennessee River and disembarking at Pittsburg Landing, Tennessee on March 20. They were assigned to the Sixth Division, which was a combining of regiments from several states. Their specific assignment was to occupy a position in the extreme front. They engaged in camp duties and drilling until the evening of Saturday, April 6th when they engaged in a skirmish with Confederate soldiers who were hidden behind a log fence. The Confederate soldiers opened with a volley directly in the faces of the Wisconsin 16th. Several men were killed or wounded and they fell back. April 7th was a full day of battle, beginning before breakfast and ending in the late afternoon – the Battle of Shiloh was one of the severest battles of the war; this deadly battle was the first conflict for these soldiers. Following this battle, the unit remained in Pittsburg Landing until May 1st when they departed for Corinth, Mississippi, a few miles southwest of Shiloh, to seek an advantage by commanding the railway system in that community. The unit remained in Corinth until May 29th. Records show Enoch died of disease in Pittsburg Landing on May 8, 1862. Because he died in Pittsburg Landing during the time his unit was in Corinth, I assume he had been too ill to travel and did not make the march to Corinth. The records of the Wisconsin 16th Regiment Infantry list 77 men who died in action, 64 who died of wounds, 267 who died of disease and 6 who died of accidents for a total of 303 men over the course of the Civil War. 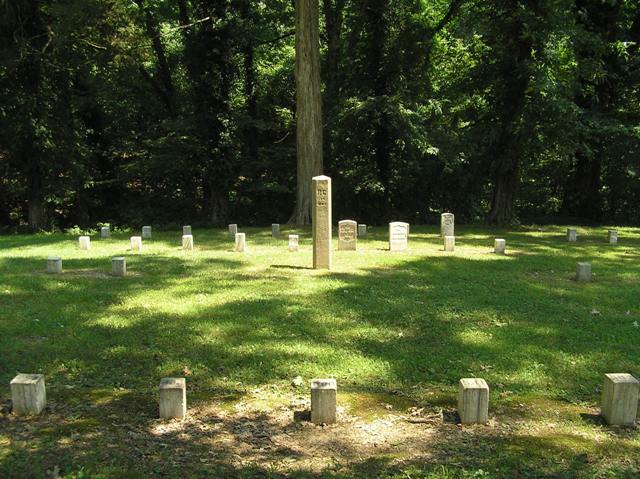 Kay and I visited the Shiloh Battlegrounds and Cemetery in 2010 and stood at the site of their battle, at the location of the camp hospital, and at the burial site for those of the Wisconsin 16th who died during those days at Shiloh. Most of the men were buried in unmarked graves with just a small rectangular pillar to mark their graves. Enoch Keithley is listed as being buried in one of those unmarked graves. At the time of his death, he was 31. He left a 26-year-old widow and three young sons – Joseph 8, Lewis 6 and Arthur 5. Martha Ann Sanford nee Jean, who was my great-great-grandmother, was [according to the 1900 census] born in February 1826 in Tennessee, probably in Lincoln County. According to chapter 4 of a reasonably well-researched book prepared by members of the Jean family, she was the fourth child of John Jean and Ann Shaw [other family trees list other sets of parents: Thomas Jefferson and Martha Larkin Jean or David Elroy and Grisella White Jean]. Martha’s story is one that illustrates that, even though we live in a time of easy divorce and ever-changing relationships with varying degrees of relationship stability, not all of our ancestors lived lives of marital constancy. Martha’s younger sister, Sarah, married Asa Sanford in 1846. Sarah died within a short time and on December 24, 1850, Martha married her former brother-in-law. The 1850 census lists Martha and Asa living between her brother Jessie and his family and her father, John and his new wife Martha Taylor – with the last name spelled as Jane rather than Jean. 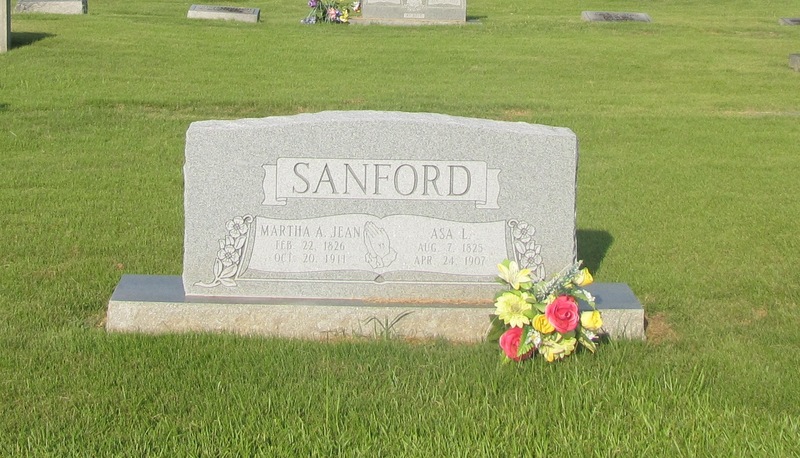 I believe this proximity is an indicator of the family relationship between John Jean and Martha Jean Sanford. Her younger siblings, Elizabeth Jean and David Jean, were living with Martha and Asa. This record also adds the details that Asa was born in Alabama and his occupation was listed as hatter. By the 1860 census, Asa had moved his family back to Tuscaloosa County, Alabama, near a small community known as Moore’s Bridge, which was where he was born and most of his extended family still lived; he also continued with his family’s business of being hatters. In the decade between 1850 and 1860, Martha and Asa had five children: Sarah, William, Jacob, Mary (my great-grandmother) and John Wiley. Some records for William have an 1853 birth date and some have an 1847 birth date. 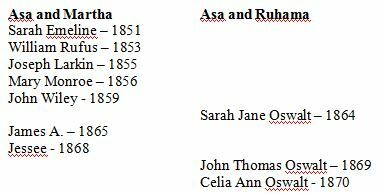 If the 1847 date is accurate, it is possible that William was the child of Martha’s sister, Sarah, and Asa. The decade between 1860 and 1870 added two more children to the Sanford family: James and Jessie. There is another John Sanford enumerated with the family but since their son John Wiley was born in 1860, it is unlikely the John Sanford listed as born in 1868 was a child of Asa and Martha. A few years back, I made contact with a Sanford researcher who was born and raised in the Moore’s Bridge community and returns home a couple of times a year for family reunions. He told me about Martha’s husband, Asa, maintaining a long-term relationship with another woman, Ruhama Oswalt who also lived in the Moores Bridge community, and with whom he had three children. When I questioned him about sources for such a relationship, he stated it was common knowledge within the community and descendants of that Oswalt/Sanford relationship still attend the Sanford reunion. The 1870 census was mostly done with initials and was therefore inconclusive for Ruhama but I will put the 1880 censuses for both families one after another. Ruhama and her three children were still living with her parents and the next farm to Martha’s nephew, William Larkin Jean. Asa and Martha lived in the Moore’s Bridge community while the Oswalt family and William Jean family lived about 35 miles north in the Ridge Community of Fayette County, Alabama. It was helpful to me to see the births of the children of the two women side by side to gain a clearer insight into the family dynamics. There were no census records from 1880 until 1900, so no information during that 20-year period. Cemetery records show Ruhama died in 1883 at the age of 46. No records indicate whether Asa and Martha ever separated during his years with Ruhama, however, in spite of his ongoing relationship with Ruhama, Asa and Martha were enumerated together in the 1900 census. Their daughter, Sarah, was still living at home and they were enumerated next to their son, John Wiley and his family. The 1900 census notes that Asa and Martha had been married for 51 years and she had borne eight children, seven of whom were still living. Since I only have a list of seven children, the deceased child was likely born during the years between one census and the next, having lived less than ten years. Asa died on April 24, 1907 leaving Martha a widow at 81. 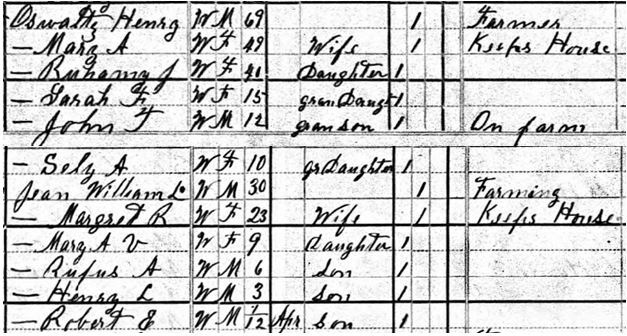 The 1910 census showed Martha living with her daughter-in-law and grandchildren after the death of her son, James, in 1903 . During the decade of 1900 to 1910, in addition to her becoming a widow, two more of her children died. Martha died October 20, 1911 and is buried next to her husband in the El Bethel Methodist Cemetery near where all the Sanford family had lived since the early 1800s [since there are other El Bethel cemeteries in the area, it is also known as Buncomb]. One of the Sanford descendants who came for a reunion a few years ao noted the headstone for Asa and Martha was either non-existent or in very poor condition; he ordered a replacement headstone, seen in the photo below. And as you view the headstone, if you walk a few steps to the right, another tombstone marks the resting place of Ruhama Oswal apparently not far from Martha in life and still nearby in death. Finding maiden names of female ancestors is oftentimes a challenge and for my great-great-grandmother, Sarah A. Farquhar, that was definitely true. To begin with, all I had to go on was the name of my paternal grandmother’s father, William Thomas Welch, who was born in January 1860. I had only been able to find him in censuses after he married in 1879. All searches prior to that netted nothing definitive and only one I thought was possible: Wm T. Welch, four months old. The parents of this Wm. T. Welch were Robert and Sarah Welch and he had three older siblings: Bashuba J. (10), James A. (8), and Mary E (4). Unfortunately, none of those people showed up in any census after the 1860 census except for William Thomas. In the 1850 census, Sarah was listed with the middle initial of ‘A.’, was 26 years old, born about 1834 in Alabama and could not read or write, as was the case for Robert. Due to the ages of the members of the household, it is assumed they are a husband, wife and four children; the 1850 through 1870 censuses did not record the relationships of people in a household. The ‘Do’ (stands for ditto) in the column beside Robert indicates he was a farmer and the numbers next to it list their monetary value at $600 property value and $500 personal property value. Some states began maintaining birth, death and marriage records at an early time while others either started later or do not make them available outside of paying for an official copy of such records. Other states’ records suffered a huge toll when courthouses were burned during the Civil War. Alabama is one of those states affected by Civil War destruction; the Fayette County courthouse has been burned twice. No records of the marriage of Robert and Sarah Welch has been found; if it had been available, my search for Sarah’s maiden name would have been relatively simple. With no census records showing up after that 1860 one, the probability was that Robert Welch had died between 1860 and 1870 with the Civil War a possible cause; however, I did not find Civil War records for him. I kept searching but found nothing additional for either Robert or Sarah Welch or any of the Welch children. I knew it was likely that Sarah had remarried but without finding a marriage record I didn’t have a surname to search for and Sarah is way too common a given name to search. To compound the problem, even the children didn’t show up, although Bashuba or some spelling variation should have been findable even if James, Mary and William or Thomas were also very common given names. When Kay and I made a trip to Fayette County, Alabama in 2010, we found an estate file for a Robert Welch who had, in fact, died prior to December 1861; since it listed his wife as Sarah, and their four children: Jane (10), James Alexander (8), Mary Isabell (4) and William Thomas (2), I was pretty confident I had found that Robert Welch. The administrator for the estate was a James Farquhar. With the youngest child of the 1850 census, Wm T., now being identified in the estate papers as William Thomas, I was reasonably confident I had found the correct family for my great-grandfather. Yet that confidence level didn’t iinclude a maiden name for Sarah. Then one day I was looking at the before and after census pages for an ancestor and saw an entry with the given name of Basheba. It was an 1880 census for Basheba Farquhar and her husband, James [I had forgotten the name of the above-mentioned administrator and this did not trigger any memory recall]. The name Basheba seemed too much of a coincidence to not follow the trail to see if there might be a connection. The first step was to see if I could find James and Basheba in the 1850 census, prior to Sarah’s marriage, and to learn if they might have had a daughter of appropriate age whose name was Sarah. I found their 1850 census and they did have a daughter named Sarah who was 17 in 1850 compared to Sarah Welch who was 26 in 1860. I then found James and Basheba in the 1860 and 1870 censuses and in looking at the families surrounding the Farquhar family in the 1870 census, I noted the family next to them was James Jackson and his wife Sarah Jackson (35 or born about 1835) and their four children, named Jane Jackson (18), James Jackson (16), Isabel Jackson (12) and Thomas Jackson (10). There were my answers: Sarah had married James Jackson sometime between 1862 and 1870 and the census enumerator had used the Jackson surname for the whole family, which explained why I had been unable to find either my great-grandfather or any of his siblings [Bashuba was using her middle name of Jane now]. With the Jackson surname, I was able to search for Sarah in 1880 and found her easily. This time Sarah was listed as 45 and once again was widowed [the tick mark just to the left of her occupation of ‘Keeping house.’ She was still listed as being unable to read or write, was again listed as being born in Alabama. Her father was born in North Carolina and her mother in Alabama. Living in the household with her was her daughter, Bell Jackson 22, and her son, James 27. The tick marks indicate Bell was single and James was widowed. She also had a grandchild named William (5) living in the household. The listing of William directly below Bell might indicate he was her child. It would have been more logical if James had been the boy’s father to have listed William below James’ name. I didn’t find a census record for Sarah in 1900, which might indicate she had died or that she had remarried. A marriage record didn’t immediately surface, nor did a death record or a burial record. Then again, one day as I was looking at a 1910 census record and noted a Sanford surname [another ancestor – one connected to William Thomas’ wife] at the top of the page. I flipped back a page to see which family he belonged to and I saw he was living with Jahue and Isabel Maddox. I wondered about the relationship between the Sanford and the Maddox families and decided to search to see if Isabel might be a Sanford; additionally, I did have a missing Isabel Welch. When I found the 1900 census for Jahue and Isabel, Jahue’s mother-in-law was living with them; her name was Sara. This time the surname was Edmondson. Further support to determine that Sara A. Edmondson was the same as Sarah A. Farquhar, Sarah Welch and Sarah Jackson and that Mary Isabella Welch was the same person as Bell Jackson, Isabell Maddox and Mary I. Maddox. This time I was able to find a marriage record for Sarah Jackson to David Edmonson that took place on April 8, 1884, and one for a J.A. Maddox and Mary T. Welch that took place November 12, 1882. In the 1800s, all documents were handwritten and T’s, I’s, and J’s look a great deal alike, which is why the marriage record was transcribed as Mary T. With those combined records, I am confident I have, once again, found a record that lets me know something of the name, age, and relationships of my great-great-grandmother. This record gives her birth as September 1832, her age as 67 and as widowed for the third time. The 1900 census also adds a new piece of information – she was the mother of five children, four of whom were still living in June 1900. None of the previous records listed a fifth child. With the ages of her children listed in 1860 of 8, 6, 2 and 4 months [with those age relationships remaining consistent in each of the census records], it is probable that her child who had died was one born between 1855 and 1857 who should have filled that missing age spot of 4 at the time of the 1860 census. It would, of course, also be possible she had a child with James Jackson who only lived a short time. I have not found any other records for Sarah after the 1900 census. She was only 67 in the 1900 census so it is possible another marriage and surname could be responsible for not finding her. It is also possible she died between 1900 and 1910. No marriage record for a Sarah Edmondson has surfaced and no death record in that name has yet been found. Her parents, grandparents, first husband and several siblings are buried in the Mount Pleasant Baptist Church Cemetery in Fayette County. This cemetery is located adjacent to her family homestead. She is likely buried there but no headstone is visible and no cemetery transcription has listed anyone with the name of Sarah. I have no family stories, no pictures of her and no specific birth date, death date or burial location. All I know, in summary – my great-great-grandmother, Sarah A. Farquhar, was born in September 1832 to James and Basheba McGuire Farquhar, was married three times [Robert Welch, James Jackson and David Edmondson] and widowed three times. She had five children, four of whom lived to adulthood – Basheba Jane Welch Anderson, James Alexander Welch, Mary Isabella Welch Maddox and William Thomas Welch. She was a grandmother to 18 grandchildren. John Buckner was my second great-grandfather – my father’s paternal grandmother’s father. My daddy would have known three out of four of his grandparents, but his paternal grandmother died about twenty years before he was born and her father had died when she was about 6. What that means is we don’t have any knowledge of him other than the brief paper trail he left. That brief paper trail to date only includes a marriage record, an 1850 and 1860 census record and a few Civil War muster cards. Not a lot to go on, including no middle name or initial. Although he was apparently John Buckner, Jr., no record for either father or son lists a middle name or initial. I don’t know if that means there was none or just that no surviving paper trail lists it. 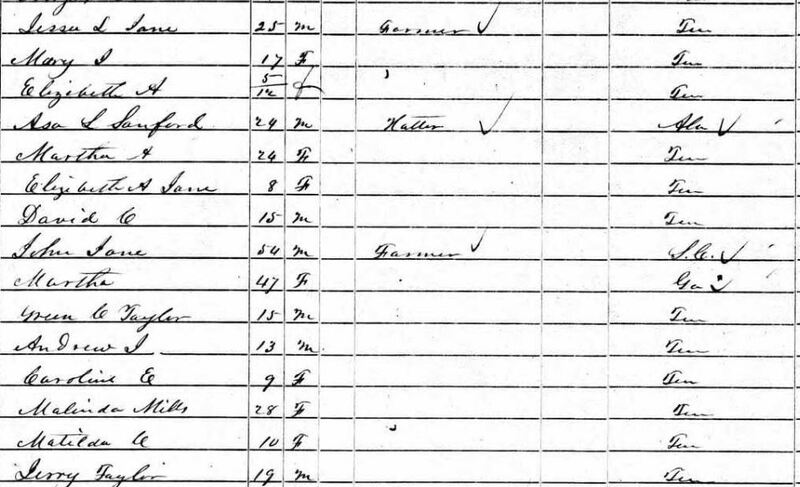 The 1850 census page for John Buckner in what is presumably the household of his parents and siblings in Blount County, Alabama; it only lists his name and an approximate time and place of his birth. John is in the center of the family unit. His age of 18 would approximate his birth year as 1832 and, according to the ditto marks from above, in Tennessee. Although relationships are not noted, it is assumed there is a relationship and that his father’s name was also John who was born in Tennessee and his mother was Rachel who was born in North Carolina. It would also appear his family had moved from Tennessee between 1834 when his brother Thomas was born and 1836 when his sister Angeline was born. His mother and three older siblings could not read or write. Since the census instructions only asked for that information about those who were 20 or older, no determination about John’s ability to read or write can be made. We found a bound index of marriages at the Blount County, Alabama courthouse when we visited there in 2010. Here is a photo clip of the page in the index book that shows the marriage of John Buckner, Jr. to Nancy M. Foster on February 1, 1855: It is unclear whether the bond was signed by John Buckner, Jr. or John Buckner, Sr. Pliney Wilemon who also signed the bond was the husband of Nancy Buckner Wilemon, one of his older sisters. The family make up is consistent with an 1855 marriage – the first child was born in 1856 and would have been my great-grandmother, Mary Jane Buckner Willis. Again John was listed as born in Tennessee, although this record would place his birth around 1834 rather than 1832. Their real property was valued at $600 and their personal property value was $400. Both John and Nancy could read and write. In their five years of marriage they had three children: Mary, William and Sarah. I looked for records of Civil War service and a possible death of John during that time frame because I didn’t find John in an 1870 census and because I found Mrs. Nancy Buckner as a head of household in the 1866 Alabama State Census, a marriage record for Nancy Buckner to Joshua Watson in 1868, followed by an 1870 census for Joshua and Nancy Buckner Watson with four Buckner children [M.J., Rufus, Sarah and Nedora – later and combined research for the children would show their names to be Mary Jane, William Rufus, Sarah/Sallie and Medora]. I found a few records at the Alabama Department of Archives and History. Further search found some muster cards that indicated he had enlisted at the age of 30 in the Alabama 41st Infantry, Company I, under Capt. Thomas I. Abernathy on May 3, 1862. Reading about the 41st Alabama indicated a number of soldiers in that regiment died while they were still in their first few days in Tuscaloosa – apparently illnesses such as dysentery and measles took a heavy toll. One of those early deaths was his brother, Jesse Wilson Buckner [evidenced by a claim filed by his father John Buckner]. 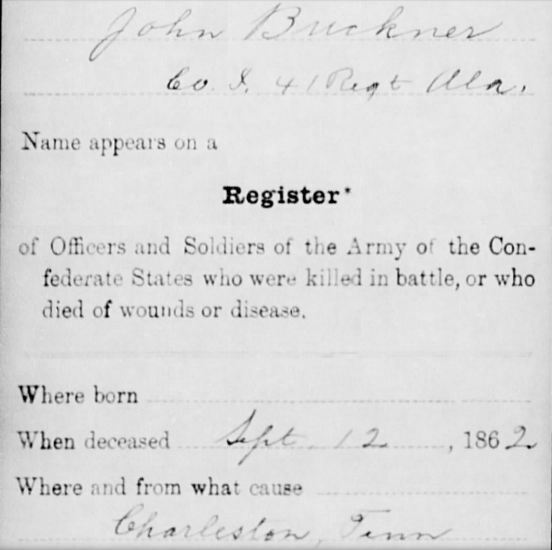 By September 18, 1862, the muster cards state John had died of disease in Charleston, Tennessee. I have used the record below because is is the clearest of the records (the others are quite faint) even though this date states September 12 for his death; two other records state the date was the 18th of September. We have not found other records in order to provide a definitive source. 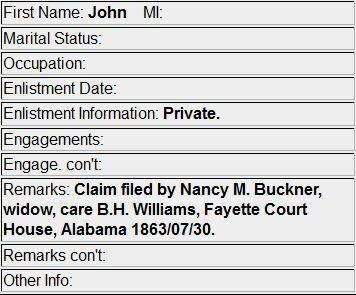 Because there were other John Buckners, I wanted further substantiation of his death in addition to his absence from the 1866 and 1870 censuses; I found a card at the Alabama Department of Archives and History showing his widow, Nancy M. Buckner [residing in Fayette County], filed a widow’s claim. Although the claim was apparently rejected, her documentation and support for the claim should have contained some valuable pieces of information about their marriage, children’s birth dates, affidavits from others who knew him and of his service. Unfortunately, the copy was mailed to the Fayette County Courthouse, which was burned during the Civil War. If Nancy had a copy of it, I have not yet located a descendant who might have it. Although the two census records we have for him indicate he was born in Tennessee, we do not know what county or town. A brief obituary for his oldest sister, EmmaLisa, stated she was born in Sevier County, Tennessee. She was born about 1818, or 14 years before John, but that provides a clue for additional searches for information. We have also found no record of his burial, which means we do not know if he was buried in Charleston, Tennessee or if his remains were returned to Fayette County. My great-great-great-grandmother, Mary A. King Foster, and I share a birthday; according to her headstone, she was born June 22, 1813, 127 years before me. I know very little about about her. Mostly what I have learned came from two census records (1860 and 1870) and her headstone. On a trip to Alabama in 2010, we found the ordination record for her husband Anthony Foster showing he was ordained in the Methodist Episcopal Church in January 1853 while they resided in Blount County, Alabama. I also found a land map that showed the location of their farm acreage in Blount County. Of course, neither of those records listed her name but her status as wife allowed to me assume her residence in that location as well as to infer a religious background. The headstone is placed at Mount Vernon Methodist Church Cemetery in Fayette County, Alabama, which would also support the inference of her religious affiliation. Although her marriage date is given on her headstone, I have not found a marriage record to support that information. It would appear to be a reasonable date since their oldest child was born in 1835. Very little information is provided in either the 1860 or 1870 census records, particularly for a non head of household. Although there are names of children listed in the household, no relationships are noted so one can only assume they may be children of the two adults enumerated together. The Blount County, Alabama 1860 census lists Mary Foster (44) born in Alabama while the Fayette County, Alabama 1870 census lists M.M. Foster (55) born in South Carolina. Although the birth year is given as 1815, in handwriting, many times a ‘5’ and a ‘3’ can be difficult to determine; consequently, the date on her headstone may or may not be correct. With census records almost always showing great diversity in ages from decade to decade, the 1860 and 1870 ages of 44 and 55, might indicate the 1815 date as more supportable. I have as yet been unable to locate information on her parents although, thanks to the obituary, I now have their names. From the two census records and reports of Bible records of births, I also have the names of all twelve of her children. Combining information from the records I have thus far, I now assume Mary was born in the Spartanburg District of South Carolina on June 22, 1815 and died in Fayette County, Alabama on December 8, 1871 having lived only 56 years but as the mother of 12 children and grandmother to many grandchildren and great-grandchildren.